Different crops create distinctly different weed niches through the crops' habits and patterns of growth. For example, potatoes, sweet potatoes, and squash rapidly form dense canopies that shade the ground within four to six weeks after crop emergence, while carrots and onions may cast only partial shade throughout their life cycle, so that sun-loving weeds like common purslane are more likely to thrive and cause problems in the latter. The shade from corn and tomatoes extends much higher off the ground than that of low-growing vegetables like lettuce and sweet potatoes, so that a tall, fast-growing weed like pigweed can more quickly escape the shade of the lower-growing vegetables. In addition, some crops suppress certain weeds through direct competition or release of growth-inhibiting substances (allelopathy); for example, sweet potatoes can suppress the growth of nutsedges. Tillage and other soil disturbances can trigger germination of light-sensitive weed seeds as well as remove competition from other vegetation. If the timing of such disturbance corresponds with their optimal season of emergence, and subsequent conditions favor weed growth, the weeds thrive. Mechanical planting, in which soil in the seed row is first disturbed and then firmed by the press wheel, can induce certain weeds to come up within the crop row. The timing of planting can influence both density and species composition of the weeds that emerge with the crop. This is partly why different weeds trouble different crops—pigweed and velvetleaf in corn versus chickweed and deadnettle in fall-planted garlic or greens, for example. Whereas farmers usually cultivate to remove weeds before they hurt the crop or set seed, most cultivation implements are not 100% effective against all weeds. For example, perennial weeds that emerge from rhizomes, tubers, or other structures located several inches below the surface may survive shallow cultivation with an implement designed to kill small weed seedlings. Rotary tillage that mixes and pulverizes the top few inches of soil tends to trigger germination of small seeded annual weeds like galinsoga, pigweeds, foxtails, and purslanes. On the other hand, deeper inversion tillage can reduce the ability of these weed seeds to emerge, yet at the same time bring more deeply-buried weed seeds to the surface, which may break their dormancy and stimulate germination. Other weeds with larger and longer-lived seeds, such as common cocklebur, velvetleaf, and morning glories, may become more common on fields that are plowed annually ahead of row crop planting. Fertilization and irrigation play subtle but important roles in weed niches. Some weeds, such as lambsquarters, pigweeds, and quack grass, respond vigorously to soluble nitrogen (N), and become much more aggressive competitors if the crop receives all of its N fertilizer in readily-available form at planting. If the N is applied later or in split doses—or better yet, if most of the crop's N is derived from slow-release sources and abundant soil organic matter—these weeds may become less competitive. In-row subsurface drip irrigation creates a much less favorable niche for small-seeded annual weeds than overhead irrigation that evenly waters the soil surface of the entire field. On the other hand, yellow nutsedge, which emerges from tubers and does not require high levels of soluble N, may remain competitive in a drip irrigated crop growing on slow-release organic N sources. Weeds exist that can exploit virtually every possible pattern, or niche, associated with production of hundreds of different crops in all parts of the world in which agriculture occurs. However, no one weed species has evolved to exploit all or even most of these niches. Weed problems are most likely to develop when weeds are exposed to a reasonably predictable pattern of disturbance that allows their population to increase over time. For example, suppose a field is clean-tilled and planted in mid May, cultivated once or twice during early crop established, and is not tilled again until after crop harvest at the end of summer. Those weed species whose seeds germinate in late spring or early summer in response to tillage and cultivation, and complete their life cycles within 60 days or so, can successfully set seed under these conditions. If tillage, cultivation, planting, and harvest schedules remain approximately the same year after year, these weeds will likely multiply over time and eventually compete severely with the crop. In developing a successful organic weed management program, the grower plans the cropping system and crop rotation in a way that reduces open niches in time and space to an "unavoidable minimum," such as the bare soil conditions that many direct-seeded vegetables require during emergence and early establishment, or that result from incorporating crop residues after harvest for disease management or cover crop planting. In these plans, the grower designs the system so that these unavoidable niches occur in shifting or random patterns that are less likely to allow certain weeds to take over. For example, if tillage and cultivation takes place in May–June and again in September of one year, then in early spring and midsummer the next, and the field is rotated into a red clover cover crop in the third year and not tilled again until the clover is moldboard-plowed in the fifth year, populations of prolific-seeding annual weeds like pigweed, galinsoga, and common chickweed are not likely to explode. In order to be effective, the changes in patterns of disturbance must be sufficiently great to prevent certain weeds from initiating and completing their life cycles year after year. Monocultures such as continuous corn are notoriously prone to weed pressure, because planting the same crop each year using the same tillage procedures and schedules opens up the same weed niche year after year. Consequently, populations of certain weed species, whose life cycles match that niche, may explode, making crop production impossible without the use of herbicides or draconian cultivation schedules. Research has repeatedly shown that simply switching from monoculture to a two- or three-crop rotation can reduce populations of major weeds (Liebman and Ohno, 1998). Longer rotations that include cool- and warm-season crops can be even more effective (see literature review in Brainard et al., 2008), and can increase the possibility of crop allelopathy (release of specific plant-growth inhibiting substances) hindering some of the weeds. However crop rotation may not alone be sufficient, as many market gardeners battling high populations of summer annual weeds can attest. Rotate crops—a long (4–10 year) diverse rotation is best. Vary planting and harvest dates. Vary dates of tillage and cultivation. Vary tillage practices—depth, frequency, intensity, degree of inversion. Vary weed control tactics—flaming, mulching, and mowing, as well as cultivation. Vary irrigation, nutrient inputs, and other cultural practices as appropriate for different crops. Include several different cover crops in the rotation—aim for one per calendar year. When practical, vary methods of cover crop residue management. This strategy can be further refined to address specific weed problems as they emerge. In addition to selecting control tactics known to be most effective on a problem weed, disrupt its niche by changing the timing of soil disturbance, or by switching to crops, fertility, tillage, and moisture regimes that are unfavorable to the weed. Because weed floras constantly respond to farming practices and changes in their environment, this may necessitate modifying the farm plan based on field observations each year. Continuous corn or a simple corn–soybean rotation, in which fields are moldboard-plowed every spring before planting, creates a predictable pattern conducive to several aggressive, large-seeded annual weeds, including velvetleaf, common cocklebur, morning glories, and prickly sida. These weeds can germinate from a couple inches depth, and remain dormant and viable for years or decades when buried more deeply. Simply switching to noninversion tillage, minimum till, or no-till may be enough to reduce pressure from these weeds, as their seeds are more likely to deteriorate or get eaten when they must overwinter near the soil surface. However, if the farmer stays with continuous corn or corn–soybean, other weeds better adapted to reduced tillage—annual grasses and invasive perennials—may emerge as big problems. Biodynamic farmers in Europe have found that farms growing both grains and vegetables have less weed pressure than farms that only grow vegetables. Grain farms with a balance of early seeded row crops, later seeded row crops, spring small grains, and winter grains together with appropriate cover crops have far less weed pressure than vegetable-only farms (Jean-Paul Courtens, personal communication). Including crops with highly competitive growth habits is important For example, cash crops and cover crops that produce dense shade not only retard the growth of emerged weed seedlings, but can induce dormancy in the weed seed bank that lasts into the next growing season (Rademacher, 1939; Klaas and Mary-Howell Martens, personal communication). Most vegetable growers have a greater opportunity to diversify their rotation than row crop farmers. For example, a four-year vegetable rotation might consist of sweet corn–snap beans–squash family–tomato family, with winter cover crops planted after each vegetable. While this is considerably more diverse, it can still result in heavy pressure from pigweeds, lambsquarters, foxtails, galinsoga, and other summer annuals. Why? Tillage and cultivation patterns remain fairly consistent year after year, especially on those farms that rely on the rototiller to incorporate cover crops, prepare seedbeds, and till down vegetable residues in the fall. These small-seeded weeds emerge in response to the soil pulverizing action of the rototiller that occurs reliably each year in the late spring. Adding some cool season vegetables and summer cover crops to this rotation shifts the dates of tillage year to year, and can make it harder for this suite of weeds to multiply. When summer vegetables are planted, the late spring niche for emergence of these weeds can be reduced by managing the cover crop with mowing or rolling rather than tillage. If the weed seed bank is really heavy, it may be necessary to use a cultivated fallow (repeated shallow tillage to trick the weeds into coming up, only to be killed by the next cultivation) to draw it down to manageable levels. Galinsoga deserves special mention as a nightmare weed for vegetable growers in the northeastern US. It can form mature seed in as little as 30–40 days after emergence, and the next generation pops up after the next cultivation. One way to take this weed by surprise is moldboard plowing or other inversion tillage—its seeds can neither emerge nor survive longer than a year when buried in the soil. However, a simple change in crop rotation with reduced tillage can also work (see sidebar). During the first few years that my neighbors and I attempted to grow mixed vegetables in our cooperative homestead garden in Floyd, Virginia, we routinely rototilled beds before and after each vegetable crop. Soon, the summer annual weed galinsoga (Fig. 1) was a terrible problem. If we planted carrots, beets, or even beans, they seemed to come up as galinsoga. If we set out onions or other slow-starting vegetable seedlings, galinsoga overtook them and choked them out. Pulling galinsoga became a Sisyphean chore, because uprooted galinsoga plants have an amazing ability to reroot and resume growth. To make matters worse, galinsoga flowers within 30 days after emergence, and sets thousands of mature seeds soon thereafter. Dealing with this weed to maintain just a quarter acre of vegetables threatened to become a full time occupation. Figure 1. 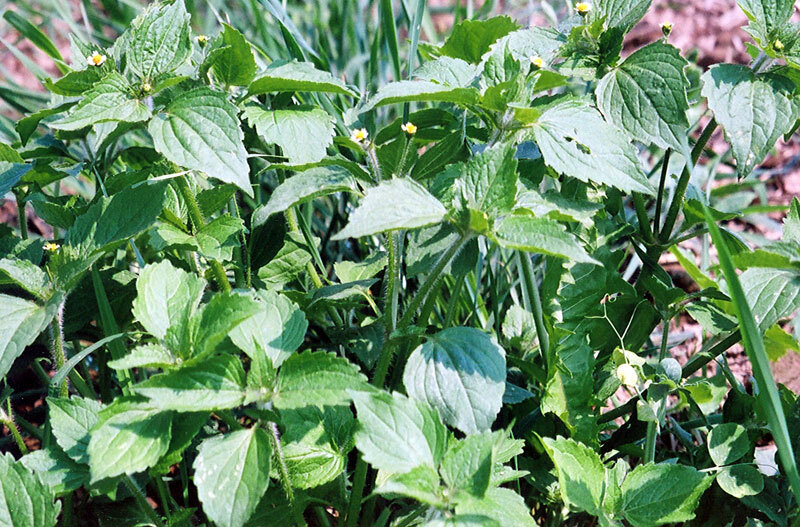 Galinsoga, a small weed that can pack a big wallop on vegetable crops. The plant forms viable seeds almost as soon as the flowers show color. There are two species: hairy galinsoga (shown here), and smallflower galinsoga whose leaves and stems are mostly smooth. However, they are very similar in appearance, life cycle, and impact on production. Figure credit: Mark Schonbeck, Virginia Association for Biological Farming. Then, one fall, I decided to plant garlic in one of our most galinsoga-infested areas. I tilled up the beds in October, added compost, planted the cloves, and applied several inches of mulch hay. Next spring I braced myself for hours of work pulling bushels of galinsoga out of the garlic—but, lo and behold, there was only a moderate weed growth, and two hand-weedings sufficed. Even more interesting, it was a different weed flora—some smartweed, some annual grasses, some chickweed, and only a few galinsoga. Then, after digging the garlic in July and planting another crop for late summer, there were still only a few galinsoga. Simply changing the tillage schedule had tamed a seemingly invincible foe. Meanwhile, in another part of the garden, I began to manage the overwintered rye–vetch cover crop, not with the rototiller, but with a scythe. A week or so after cutting the cover crop, I cleared narrow strips of soil, dug out rye roots with a spading fork, and planted summer vegetables. Here too, the galinsoga became more manageable. Now, eight years later, with reduced tillage (averaging once per year in any one bed, rather than two or three times), and a diversified rotation (we make sure to move that fall garlic to a different section every year! ), galinsoga is still present but no longer domineering. We still have to spend some time removing seedy galinsoga plants to keep the weed seed bank from regenerating to former levels, but this species has subsided from a monstrous problem into a small one. A really good weed-suppressive crop rotation exposes the weeds to a wide diversity of crops, each with its own competitive traits, and allows the farmer to vary tillage, planting, and cultivation schedules. For example, potatoes in the first year might be followed by a winter cover crop rolled down for no-till or strip-till planting of a long-season summer crop like winter squash or sweet corn in year two. The third year might be devoted to intensive production of salad greens, with several successional plantings. This can function like a cultivated fallow, as each crop stays in the ground only a few weeks, after which seedbed preparation takes out any weeds—including invasive perennials—before they have a chance to set seed or reproduce vegetatively. Add sweet potatoes in year four, followed immediately by fall garlic harvested in July of year five, and then a fall vegetable or cover crop in the brassica family, and the weeds might be really knocked off balance! Not only does such a sequence confront weeds with an unpredictable, chaotic pattern of soil disturbance, it varies other environmental factors as well, such as soil nutrient and moisture levels through the season, and the shading, competitive, and allelopathic effects of diverse vegetable and cover crops. Brainard, D. C., R. R. Bellinder, R. R. Hahn, and D. A. Shah. 2008. Crop rotation, cover crop, and weed management effects on weed seedbanks and yields in snap bean, sweet corn and cabbage. Weed Science 56: 434–441. (Available online at: http://dx.doi.org/10.1614/WS-07-107.1) (verified 23 March 2010). Liebman, M., and T. Ohno. 1998. Crop rotation and legume residue effects on weed emergence and growth: Applications for weed management. p. 181–221. In J. L. Hatfield et al. Integrated weed and soil management. Ann Arbor Press, Chelsea, MI. Rademacher, B. 1939. The penetration of light into fields of winter sown cereals and oil plants, and its significance for weed growth. Pflanzenbau 15: 241–265. Rademacher, B. 1940. The control of weeds in Germany. p. 68–112. In R. O. Whyte (ed.) The control of weeds. Bulletin 27. Commonwealth Bureau of Pastures and Field Crops, Aberystwyth, Great Britain.